The fun continues as we learn more about the Japanese woodcut printing method, moku hanga. 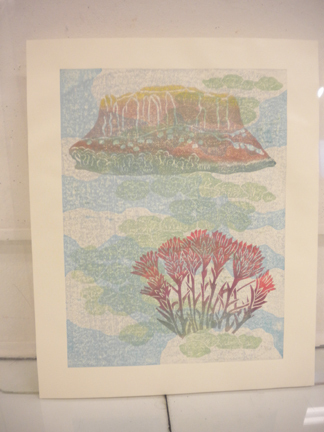 For this larger print, I have used four carved plates, two for the background and two for the foreground. I first printed a grey on an uncut block for the cloud color. Using watercolors gives the print a soft pastel quality and the texture you see is an effect called “gomazuri”.